I had my doubts but the UHN green team with special contributions made by the Joint Department of Medical Imaging had a fantastic first bake sale ever. If you didn’t have a chance to visit our table at the Toronto Western Hospital let me just tell you about some of the things you missed. 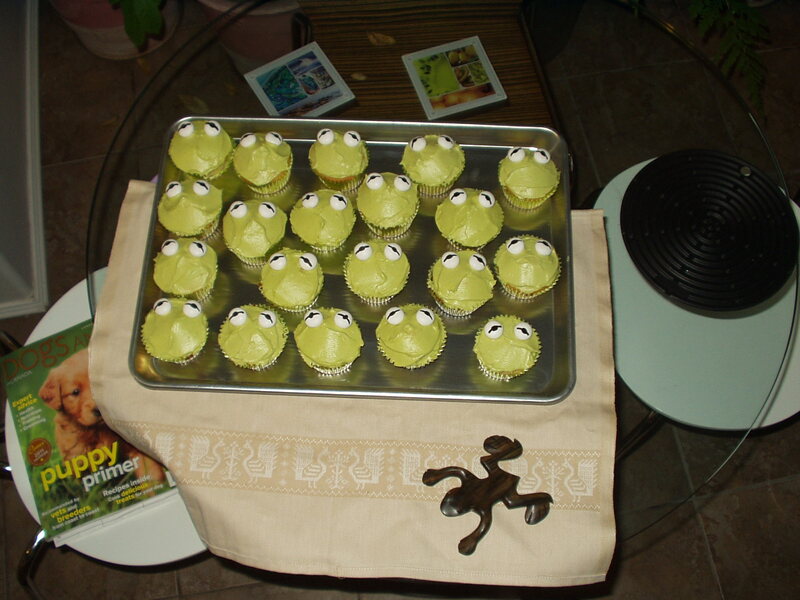 Totally Organic (including the food colour) Kermit Cakes baked by Colin – the man behind the bake sale idea. Not only did staff and patients drool over these lovlies but the happiest kid in the world squealed with delight when he realized the eyes were “minty”. We had Zebra cake too. This you are really sorry you missed. I asked Seving, it’s creator to tell me her secrets but no – this technique is guarded as only an exceptionally trained baker would understand. What looks like regular cake on the outside emerges with wild zebra stripes when it is cut. Beautiful and delicious too. There were Cookies of all shapes, sizes and flavours – each one baked to perfection with care and love. The Squares, Cakes and Muffins were divine. If you walked by the table and didn’t stop to get your treats – well I am sorry you missed your chance. In under 2 hours almost everything was gone – and to a good cause too, which by the way cuts all calories in half. Our green team now has some much-needed cash to put towards more festive earth celebrations at UHN. So thanks to Colin, Seving, Elena, Michelle, Carole, Mayce, Erin, Jayne, Tammy, Brendan, Antonia, Jen, Kathryn, Kimberly, Colleen, Lue-Ann and Cynthia. Without your mastery of butter, eggs and sugar none of this would be possible.